Martian Manhunter thinks about the heroes from space, and how Supergirl was lost. At that moment, Supergirl reappears in the present time. As J'onn focuses on the other heroes on Earth, Supergirl passes through his body and he screams in pain. She streaks through the atmosphere and crashes down in Metropolis. In Gotham, Harvey Dent battles Killer Croc and finally subdues the beast. Above the streets, Deathstroke talks to Batgirl, slowly corrupting her mind and bringing her to his side. In Italy, the Doom Patrol battle Black Adam. Booster Gold phases in for a moment before declaring that he's too soon and disappearing again. Aquaman summons spirits of the ocean for assistance in saving the people of Sub Diego. They initially refuse, but he threatens them with force and they concede, telling him there will be a price. Aquaman uses his newfound power to raise the city above the ocean and save its inhabitants. Below the ocean, Aquaman changes into a monstrous form. Across the planet, J'onn sees people trying to help against Black Adam. He cannot process the complexity of human nature and realizes that if he continues to live with them, he must change. Story - 2: I really don't want to insult Champagne. The issue itself isn't poorly written. It's not fantastic, but not horrible either. This whole World War III series just fell flat for me. I love 52. I had hoped that World War III would expand on the war against Black Adam. One issue of 52 was far too short to cover that battle. However, instead of more battling, we got a reasonably pointless look at characters in the DCU. It really seems like the editors had planned on covering concepts like Aquaman's transformation and Supergirl's return in the pages of 52 and when they ran out of space they pushed it into this book. Maybe I would have been all right with one extra issue of this, but four is just too much. As I said, I don't blame Champagne. He was handed this assignment and did a decent job of it. 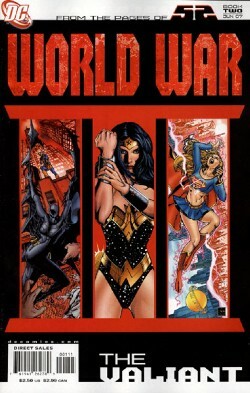 But whoever came up with the idea for the WW3 books really should have thought it through again. Art - 4: The art, on the other hand, is quite nice. Nothing really outstanding, but it's a clean style and he captures everyone in a very classic sense. And in a book that covers as many characters as this one does, it's important that they are easy to identify. Cover Art - 5: I absolutely love the design on these covers. It's clean, simple, and ties the four books together quite nicely. I also really like the idea of spotlighting three characters on each of the covers. Of course, I don't understand why this one doesn't have Aquaman on the cover in place of either Batgirl or Donna, but that aside, these are all great covers, and sadly are the best part of the whole event.